The long-awaited decision by the U.N. Permanent Court of Arbitration on a dispute between the Philippines and China in the South China Sea was released on Tuesday, and the reaction on both sides was somewhat anticlimactic. The court nullified China’s nine-dash line claim as a legal basis for maritime entitlements under the United Nations Convention on the Law of the Sea (UNCLOS). 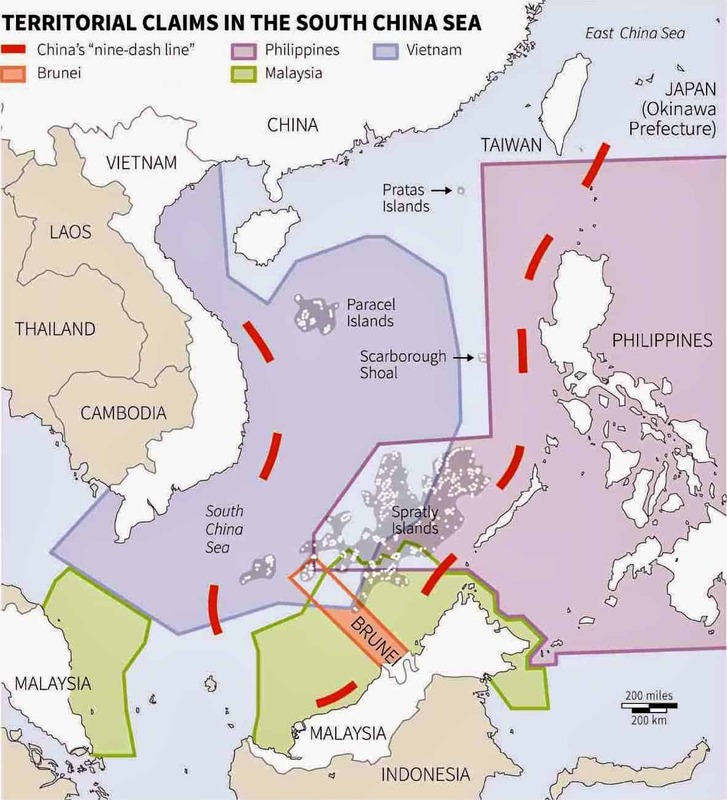 Though the verdict sidestepped decisions on the actual sovereignty of occupied features in the waters, the tribunal ruled that no features within the Spratly Islands chain, the center of the dispute, counted as an island entitled to a 200-nautical-mile exclusive economic zone (EEZ). Even Taiwan-held Itu Aba, the feature in the Spratlys most in line with the definition of an island, was ruled a rock, thus entitled to only a 12-nautical-mile territorial sea. In the absence of any features legally capable of generating an EEZ in the Spratlys, the EEZ extending from the Philippine shore gives the Philippines de facto jurisdiction over most of the waters in the Spratly Islands not covered by the territorial seas of other powers. China, along with Taiwan, which has a nearly identical sea claim, flatly declared that it would not respect the ruling. (Chinese state media went so far as to release a bizarre music video titled “South China Sea Ruling: Who Cares?”) China’s reaction is not surprising: It has spent the past several months saying that despite being a UNCLOS signatory, it would not abide by any decision. In light of both Chinese intransigence and the absence of any real enforcement mechanism on the part of the court, the ruling will evince no immediate change. The tides of the South China Sea rose and fell as they have since time immemorial. There have been no interruptions of normal shipping. Chinese soldiers remain ensconced where they were before the ruling. Even military exercises being carried out in the South China Sea by the USS Ronald Reagan aircraft carrier that appear to have been timed to highlight Beijing’s lack of jurisdiction over the waters will not change these basic facts. Signs from both Beijing and Manila reflect uncertainty about how either might proceed in the wake of the ruling. Both governments, however, appear to have reached a soft consensus to avoid unduly rocking the boat in the short term. Rather than fan the flames of protest, the Chinese government dispatched police officers to protect the Philippine Embassy in Beijing from protesters. While Philippine President Rodrigo Duterte had no immediate reaction to the ruling, Philippine Foreign Secretary Perfecto Yasay urged “all concerned to exercise restraint and sobriety” — a message that appears, at least in part, to be tailored for domestic consumption. The Chinese are holding out hope that the Philippines, under the new leadership of Duterte, can eventually be drawn out of what they see as a U.S. coalition designed to encircle China. At the very least they want to dissuade Duterte’s government from taking actions they feel would force a response that could turn international public opinion against them even more. Duterte’s government, meanwhile, has avoided binding commitments on the South China Sea and has refused to accept unconditionally the U.S. position in the waters, leaving itself space in negotiations with either the Americans or the Chinese should it need it. But Duterte cannot remain silent forever. Already, Philippine fishermen are clamoring for government protection, saying the U.N. court’s decision justifies more assertive action. Chinese media reports on fishermen in Hainan province highlighted the economic dependence of Chinese fishing villages on the sea, suggesting that similar pressures exist in China. Though Beijing and Manila intend to keep things calm, it is not clear that they are capable of entirely policing their fishermen, who appear eager to assert their rights and protect their livelihoods. The fishermen will be the greatest potential disruptor in the South China Sea in the wake of the ruling. Unlike protesters on the street, fishermen at sea, particularly in large numbers, are beyond the easy control of law enforcement. The greatest struggle for both countries will be to rein them in, preferably before they get to sea, lest they disrupt the delicate peace. China’s long-term challenge in the South China Sea — keeping the maritime states in the Association of Southeast Asian Nations divided while avoiding excessive costs to its reputation — is difficult enough without unplanned crises at sea. — “The South China Sea Ruling: Anticlimax” is reprinted by permission of Stratfor. PreviousEnd of the World? We Don’t Know How Good We Have It.